We live in stressful times, constantly bombarded with the need to go faster and faster while still maintaining a high level of productivity. With more and more single parent households, aging seniors and troubled financial times, fear and anxiety become the norm as we deal with the unknowns in our lives. Advanced technology further complicates our choices because we are led to believe that we need to purchase all the newest electronic product or be left behind. After running all day, we plop into bed at the end of the day and hope we can get enough rest to get up in the morning and start all over again. Our energy source has been compromised. “Normal” stress that allows us to live has been turned to “dis-stress”. And what is worse we are led to believe that is the only way we can live. We have had ups and downs and difficult times throughout history. It takes fortitude, planning and flexibility to meet the challenges we face in any generation. If we use our normal stress energy on endless worry, anxiety and irrational fear, we will soon become dis-stressed and our ability to be proactive and productive will be compromised. 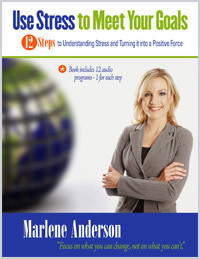 In my book, “Make Stress Work for You, 12 Steps to Understanding Stress, Turning it Into a Positive Force”, available on my website, I offer strategies to both understand your personal stressors and ways to combat destructive stress. In the upcoming weeks, I will take you through these 12 steps. When we understand that “stress” in its truest sense means energy, we will want to harness that energy. We see that natural energy in all forms of nature. Watch a horse that can’t wait to get out of the starting gate; a cat with controlled energy waiting to pounce on the unsuspecting mouse, or even a spring flower bulb that uses plant energy to push up through resisting soil to reach the light. Or observe the athlete at the starting gate, who has prepared himself over weeks and months to be ready to use that energy to run to the goal line. Follow my blogs and see if you can identify obstructions that keep you from using your energy productively to achieve your goals.